Hormones, which are produced by the endocrine system, regulate a person’s immunity, reproduction, mood, metabolism, growth and overall physical development. There are three types of hormones (estrogen, androgen, and the thyroid hormone) that each have their own responsibilities and obligations. It is well known that some of the most common skin conditions (including acne, dry skin, and hyperpigmentation) can be the result of hormones being out of equilibrium. 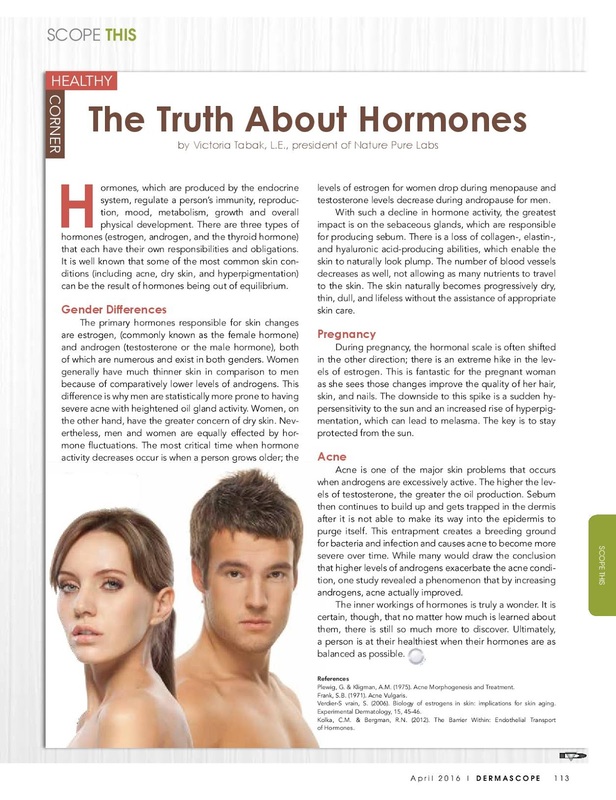 The primary hormones responsible for skin changes are estrogen, (commonly known as the female hormone) and androgen (testosterone or the male hormone), both of which are numerous and exist in both genders. Women generally have much thinner skin in comparison to men because of comparatively lower levels of androgens. This difference is why men are statistically more prone to having severe acne with heightened oil gland activity. Women, on the other hand, have the greater concern of dry skin. 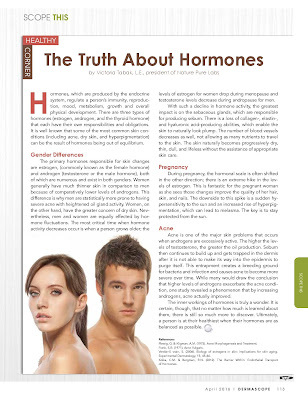 Nevertheless, men and women are equally effected by hormone fluctuations. The most critical time when hormone activity decreases occur is when a person grows older; the levels of estrogen for women drop during menopause and testosterone levels decrease during andropause for men. With such a decline in hormone activity, the greatest impact is on the sebaceous glands, which are responsible for producing sebum. There is a loss of collagen-, elastin-, and hyaluronic acid-producing abilities, which enable the skin to naturally look plump. The number of blood vessels decreases as well, not allowing as many nutrients to travel to the skin. The skin naturally becomes progressively dry, thin, dull, and lifeless without the assistance of appropriate skin care. During pregnancy, the hormonal scale is often shifted in the other direction; there is an extreme hike in the levels of estrogen. This is fantastic for the pregnant woman as she sees those changes improve the quality of her hair, skin, and nails. The downside to this spike is a sudden hypersensitivity to the sun and an increased rise of hyperpigmentation, which can lead to melasma. The key is to stay protected from the sun. Acne is one of the major skin problems that occurs when androgens are excessively active. The higher the levels of testosterone, the greater the oil production. Sebum then continues to build up and gets trapped in the dermis after it is not able to make its way into the epidermis to purge itself. This entrapment creates a breeding ground for bacteria and infection and causes acne to become more severe over time. While many would draw the conclusion that higher levels of androgens exacerbate the acne condition, one study revealed a phenomenon that by increasing androgens, acne actually improved. The inner workings of hormones is truly a wonder. It is certain, though, that no matter how much is learned about them, there is still so much more to discover. Ultimately, a person is at their healthiest when their hormones are as balanced as possible. Plewig, G. & Kligman, A.M. (1975). Acne Morphogenesis and Treatment. Frank, S.B. (1971). Acne Vulgaris. Verdier-Sévrain, S. (2006). Biology of estrogens in skin: implications for skin aging. Kolka, C.M. & Bergman, R.N. (2012). The Barrier Within: Endothelial Transport of Hormones. Written exclusively for Dermascope Magazine. Did you know that alpha hydroxy acids (AHA) essentially are fruit acids? These wonderful fruit acids are one of the most effective ways of brightening the skin. Brightens pigmentation due to blemishes or sun spots Retexturizes skin to smooth uneven texture and even fine lines, wrinkles and skin tone Moisturizes and nourishes skin to improve dry skin Gently exfoliates skin removing dead skin cells to improve acne skin condition Increase skin thickness by stimulate collagen production The most common alpha hydroxy acids are glycolic, lactic, citric, malic and tartaric. 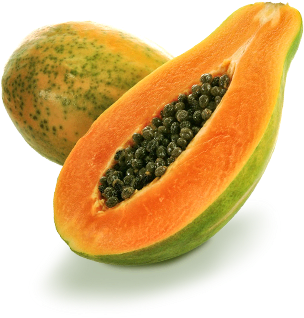 The astounding digestive system support of papaya fruit is well-known, but the benefits go far beyond. Papaya is multi-faceted in its spread of skin stimulating and improving qualities. It's abundant with vitamins, minerals, tons of antioxidants and of course enzymes. The papaya fruit is an excellent source of vitamin A, vitamin C, beta-carotene, bioflavonoids, potassium, calcium, and magnesium. It offers intense skin nourishment while promoting a smooth and firm complexion. The high concentration of antioxidants effectively rid skin of cell-damaging free radicals, supporting overall holistic wellness. Papain enzymes breakdown inactive proteins and cells on the outermost stratum corneum epidermal layer of the skin. This enables the most gentle and natural way of exfoliating. It clarifies skin from all surface dead cells and impurities. Simultaneously the proactive new cell regeneration stimulates new skin and collagen fiber production effectively encouraging a youthful appearance. As Mother’s Day rapidly approaches, I find it an especially important time to reflect not only as a mother of two amazing boys, who certainly keep me on my toes, but also as a daughter, granddaughter and simply as a women, who as so many others, daily, perfects the art of juggling and multi-tasking more efficiently. Certainly, as a Mom, I have truly learned the meaning of giving and loving limitlessly and unconditionally. Sounds easy, but let's be frank, it takes patience beyond normal comprehension, strength greater than what we think we have in us, and truly, there is no manual that prepares any parent for all the stages of raising another human being. We as Moms are all figuring it out, hoping to raise someone that will hopefully contribute to this world in a positive way, leaving it a little bit better than how it was before our children entered it.